Dell XPS 8700 computer locked on the Windows 8.1 "rainbow" log in screen. Some days ago I bought a new Dell XPS 8700 computer. Everything has been OK so long. The best computer I have ever had and I have had many. I found some articles. Some suggest using Shift + F8 (repeatedly?? ), F2 or F12, F4 F6, but neither functioned. There is no recovery CD that I can start the computer from. I am a fairly experienced computer user, I have reformatted a lot of computers, configured recovery CD start from the BIOS, installed different hardware components. I have installed some programs that I don't want to loose? So do you have a proposal for the solution? If I manage to log in in safe mode, is it enough to do a soft shut down? Do I need to do a system recovery? Make it simple, as simple as possible, but no simpler. RE: Dell XPS 8700 computer locked on the Windows 8.1 "rainbow" log in screen. You need that Windows 8 emergency boot disc you created when prompted by the operating system. That's what it's for. Boot to that and follow the instructions. Thank you for your answer. I have also sent a email to dell support with no answer so long. I have as I write above configured, formatted and reformatted many computers. I am used to being asked about creating a boot disk when configuring the Pc on the first start. I was not asked to create one when I first started my computer. Some computers also have a system recovery partiticion. I tried a 32 and 64 bit Windows 8 disk that I bought to my Acer laptop. That did not function either. I also held down the Shift key while starting the computer and then hit the F12 Key. Then I ran the complete diagnostics test for three hours. No error was found. I am not new to computers and know how important it is to have a system recovery CD. I always create them like on the Acer Laptop when asked. Is there a way to run Windows 8.1 in safe mode? It may be enough to run Windows 8 in safe mode and log out and restart the computer. So can you send med a system recovery CD? The screen is completely locked on the log in screen. My suggestion would be to call Dell and request a recovery CD or flash drive. Ok I called Dell and they will send me two CDs, a system restore CD and a Drivers and utilities CD. In the mean time I have tried to fix the problem myself. It is possible even if the Norwegian version Miss the last option: Windows startup settings. I reach the menu this way. 2. Hold down the shift key permanently and restart the computer. 3. Now I come to the screen where I can choose F2 Settings or F12 Boot options. Now I reach the advanced Options menu explained above by starting the computer from My 64 bit Windows 8 Pro CD that I bought to my Acer Vista Laptop. Windows Startup Settings so I have to try the other options. article may help me. Automatic repair did not help, so I have to try the other options. does not function and system restore is only available when you are logged in. The only remaining option is a full restore where my installed files (programs) will be deleted. I wait for the system recovery CD from Dell, since that Windows 8.1 Cd may be better than the Windows 8 installation CD I bought for my laptop. The traditional DOS exit command functions fine. Are all computers made in China today? Initially it was a good experience with a computer that functioned very well for a week. This is one of my worst experiences with a new computer. Yes, most of them are, especially the Laptops. Foxconn makes computers for Dell and Apple and Many other vendors.Foxconn, which employs some 1.2 million workers in China is one of the largest manufacturers in the world. 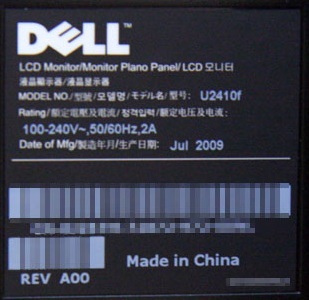 Dell part numbers starting with CN are made in china whereas if they start with MX they are made in mexico. I haven't seen any Dell products that don't say made in china right on the box. I have now slept a night on this problem. According to <legalistic deleted>, you can cancel the purchase if an item has a significant deficiency. In my opinion it is a significant deficiency if you can not start a computer in safe mode. I talked about half an hour with David <last name deleted>at Dell. He were not able to tell me how to start the computer in safe mode. We did agree that the computer was completely frozen on the log in picture. Time is definitely money, and I can not risk having to reformat the computer more or less frequently. I will send Dell an email that I want to cancel the purchase so I can buy a computer without this deficiency. Any opinion? There may be other Safe boot options from Shift + F2. I am trying that now. The recovery and drivers and utilities disk should come today. I am still waiting for the system recovery disk and hope that there is a way to log in without having to format the C drive and restore the operating system to factory settings. In the mean time I try the other options from the F2 and F12 menu. There a big UPS car came with the disks. That delivery was timely. Excellent Dell . There are also some interesting options on the Shift + F2 menu that is explained in the user manual. Boot settings configuration. That may solve the safe mode boot problem. I try that before I try anything else. The computer came with Secure boot set to off. I have changed that to on. Now the problem is perhaps to use the right key combinations to start Windows 8.1 In secure mode. F8 that functioned on earlier Windows versions does not function. Neither does Shift + F8. The USB stick will hopefully solve the problem. From Setup I now boot from the SB stick. System recovery to the first recovery point did not function. I get an error that system recovery was not finished and I can try another point. It is great that these menus are available from the recovery stick, but so far without success. I try another point before a full reinstall that is my last option. There are four restore points. I have tried them all and no function. I have one option left, take a full format and reinstall. I don't like it. David from Dell technical support said that he should call me and ask how I solved the problem. This is not good enough. I start the full system restore.